The 2014 Dutch Individual Chess Championships for men and women took place on 6-13th July 2014 at the Manor Hotel in Amsterdam, the capital and most populous city in the Netherlands. Both events were played in 8-player round-robin format. The Women Section was won by WIM Anne Haast, who collected 5,5/7 points, leaving the runner-up half a point behind. WGM Bianca De Jong-Muhren finished second with 5/7, full point ahead of the bronze medalist GM Peng Zhaoqin, who has the record number of 13 champion titles. GM Loek Van Wely and GM Sergei Tiviakov shared first place in the Men Section on 4,5 points each. The champion was decided by a tie-break match of two games with a time control 5′ + 3″. Van Wely claimed his seventh title after outplaying his opponent 2-0. 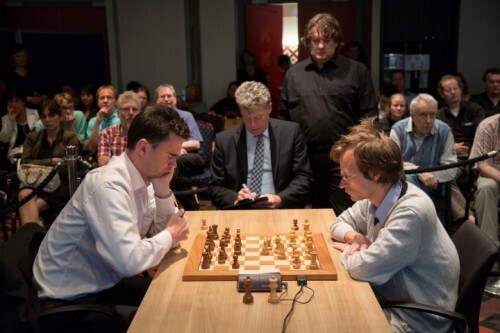 Third place was shared by GM Sipke Ernst and Wouter Spoelman on 4 points each.